The guest can cancel free of charge until 3 days before arrival. The guest will be charged the first night if they cancel within the 3 days before arrival. If the guest doesn’t show up they will be charged the total price. The guest will be charged a prepayment of the first night in the 3 days before arrival. Phenicia Motel is the place to be before your journey begins. Our vision is to make our guests feel at home while away from home while enjoying a relaxing and extremely friendly environment. Our staff are friendly and helpful and will go the extra mile to provide you with the necessary service and information required. 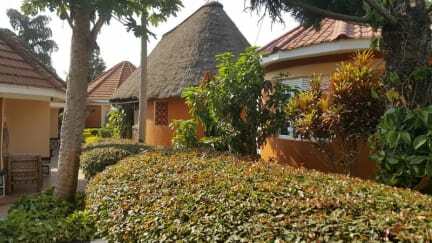 Our Staff will assist you in deciding where to go in Entebbe and the whole of Uganda. Transportation could be arranged whether with the local transportation, Taxis, special hires, Boda-Boda or with the hotel car. Phenicia Motel is pet friendly, come along with yours. Riders Night Club is 1.6 km from Phenicia Motel, the famous Oz Bar is at 5 minutes drive, while Wild Frontiers (Private Day Tours) is 1.7 km away. Taxi station is at 300 meters where you can enjoy a ride to the capital Kampala and the state house is at 1 Kilometer away. the United Nations Logistics Base/Regional Support Center is 100 meters way from Phenicia. 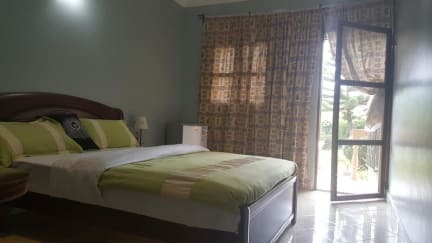 The nearest airport is Entebbe Airport, 2 km from the property. All rooms are air conditioned & self-contained, the property completely renewed & refurnished less than one year ago. Rooms include a flat-screen TV with satellite channels. Some rooms feature a seating area to relax in after a busy day. Rooms have a private bathroom. There is a 24-hour front desk and manicure/pedicure place at the property. Guests can enjoy the on-site restaurant. You can play darts and enjoy a cold drink at the bar. Free private parking is available on site. Payment upon arrival by cash, debit & credit card (5% surcharge on cards). This property may pre-authorise your credit card.